Every year, Deft Research does a study asking consumers with Individual and Family Plan (IFP) coverage if and why they switched coverage. This year, they conducted surveys during OEP and afterwards to identify the reasons behind consumers switching plans. Due to things like carriers exiting the on-exchange and off-exchange markets, many people have been forced to switch plans—33% of all switchers this year. Deft found that the largest category of switchers were voluntary switchers—50% of all switchers this year. The most cited reason for switching (forced) was that the consumer’s previous plan was discontinued (40%). 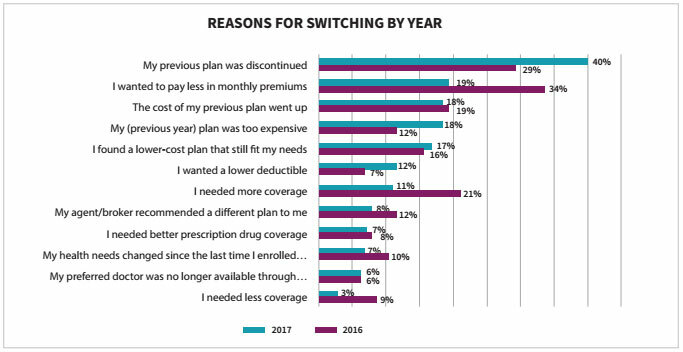 You’ll see that the next most cited reason for switching (voluntary) dealt with price: “I wanted to pay less in premiums” (19%), “my (previous year) plan was too expensive” (18%), “I found a lower-cost plan that still fit my needs” (17%), “I wanted a lower deductible” (12%). So now that we know why people are switching, whether being forced or voluntary, let’s think about how you as agents can capture these potential clients during their switch shopping experience. Capturing these potential leads requires a combination of presenting your agency at the right time in the right place and having the technology to quickly follow up with these people. It also requires that you continue to service them in a way that will make them want to stay with your agency, even in the event that they’re forced to switch plans. 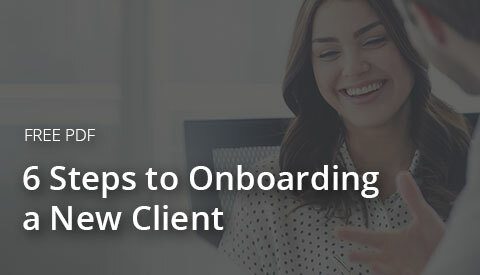 If you’re providing excellent client service, they’re likely to still work with you on finding a new plan instead of starting their search from scratch. First and foremost, are you presenting yourself and your agency online? Eighty-one percent of people research online before contacting vendors or making a purchase decision. If you don't have a website, these people won't even know you exist, let alone buy from you. Also, is your website mobile friendly? When 40% of our time online is spent using a mobile phone or tablet, and nothing is more frustrating to than having to pinch our screens and endlessly scroll to find the information we’re looking for. A way for your prospects to reach out to you should be front and center on your website. While some will still look for your phone number to call you, many will want to fill out a form to test the waters first. So, have a form that asks for their first name, last name, email address, phone number, and a text field for them to enter their concerns or questions. Any other information you may want on your leads you can gather when you speak to them next. Putting too many questions on a form tends to shy people away from filling them out. Now what? Actually capturing these prospects is all in the follow-up. It sounds crazy, but many insurance agencies have a lead form on their website, but don’t follow up. Or, they wait days to follow up. Did you know, if you follow up with web leads within 5 minutes, you’re 9 times more likely to convert them? 9 TIMES more likely! And, honestly, most people who don’t receive a follow up within a couple hours have already moved on to a competitor. Your next question might be: how on earth does anyone follow up within 5 minutes? Well, it’s actually a lot easier than you’d think. You simply send an automated email every time someone fills out your form. Plus, send yourself an automated notification so you’re aware of the new lead in case you have a chance to add a phone call to that email. We all know insurance agents don’t generally have free time to wait for new leads to come in, so that’s why they use automation. Many utilize automation tools within their agency management system (AMS), like AgencyBloc. Learn more about AgencyBloc's Automated Workflow and how your agency benefit. Beyond AgencyBloc’s CRM capabilities to track clients, prospects, and policies, agencies set up automation to ensure things get done and, most importantly, prospects and clients are communicated with when necessary. Lead forms in AgencyBloc integrate with the automation tools, so it works pretty seamlessly. Google is where almost everyone goes first to search for products or services—they own 77% of the search engine market share as of now. So, that’s definitely where you want to present your business. Your website itself will come up in the search results list if your website’s SEO (search engine optimization) is sufficient. However, it’s really standard now to actually list your business with Google. This listing makes it extremely easy for prospects to contact you. Even if they’re referred to you, they’re still likely to do a quick search on you, so that’s another reason this is so important. Learn from Google Premier Partner, Spinutech, the best practices for listing your company with Google. Bonus points if you have a killer LinkedIn profile. Insurance agencies often ask what the best social network to be on is, and there isn’t a clear-cut answer for that. We did write an eBook about it, though: Social Media for the Insurance Agent. What we do know is that whatever social profile you have, you need to be optimizing it for insurance sales. We found a few examples of insurance agents who are doing it well, and we gathered them up in this blog: "3 Examples of Sales Optimized Insurance Agent LinkedIn Profiles". Another quick tidbit I noticed in Deft Research’s study is that they found the opportune time to market yourself to capture the OE switchers, and they suggest focusing your marketing efforts in November. They looked at when switchers begin to shop and when they tend to make a decision. Most switchers begin shopping during the month of November and make a decision in December. So, if you do any paid marketing efforts like Facebook ads, I would run these in the first couple weeks of November. Not sure how to get started with Facebook ads? 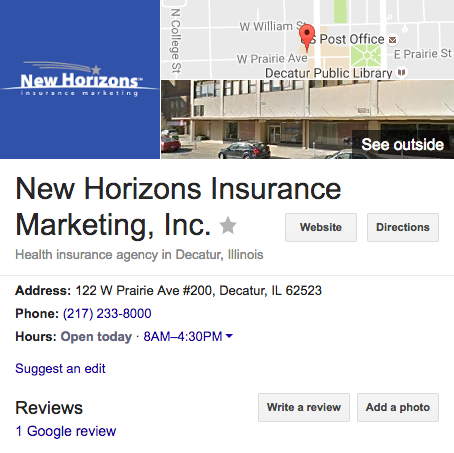 Check this blog out: "5 Facebook Marketing Tips for Insurance Agencies". 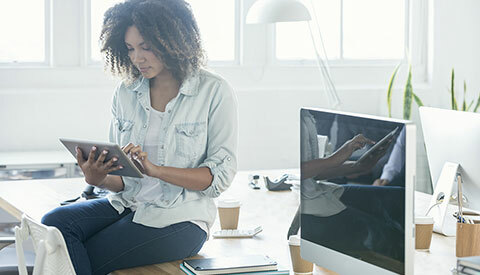 So now that we’ve covered how to capture potential leads during this year’s OE season, let’s talk about how you can keep them during next year’s. Whatever your clients are faced with this year and all the coming years, you want to be the one they turn to. There is no super special secret to keeping clients. It’s really just about communicating with them often. Many agencies don’t reach out to their clients enough. They don’t want to be a “bother” or annoyance, so many just think their clients will reach out to them if they need something. But that’s a big mistake. Studies have shown that the #1 reason clients leave an insurance agency is due to lack of communication. Turns out, your clients want to hear from you more often than you think. 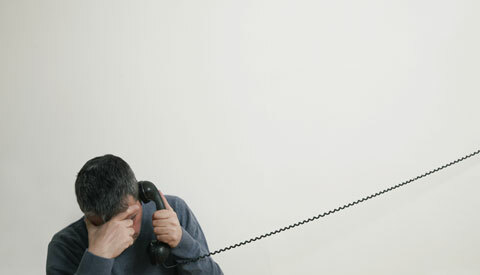 Unfortunately, a study showed that “only 44 percent of consumers had contact with their agent in the past 18 months”. Don’t let this be your agency! Welcome emails. This is the time to make your first impression and set the tone for how you’ll communicate with your new client. Keep it brief, but send a quick “welcome to the agency” email with your contact information (email, cell phone, office phone) and let them know you’re looking forward to working with them. *Bonus points if you offer them the option to text you! Birthdays! This is an opportune time to reach out solely to wish them a happy birthday. They’ll appreciate the gesture. *Bonus points if you send them a handwritten card wishing them a happy birthday! Policy renewal reminders. Send a friendly reminder that your client’s policy is up for renewal soon, and let them know you’d love to chat with them and discuss any questions or comments they have. Send any paperwork (with instructions!) that pertains to the renewal in this email with your contact information front and center so they can get a hold of you easily. The policy renewal reminder example would definitely be something you’d want to do each year for OEP. Keeping communication lines open is so important when you know your clients could be forced to switch or to find out if they’re considering voluntarily switching and what the reasons are behind that. When you have an AMS with automation capabilities, the options are endless for ways to maintain communication with your clients. Even if you’re an agency that would rather call your clients than send an email, you likely still need to be reminded to make that call. Automated reminders (with the phone numbers on them!) will pop up when the specific date approaches! Client satisfaction doesn’t end at regular communication, though. We all know that you talk with clients most when an issue arises. Even if it’s not you directly that deals with claims or policy questions, you better be sure whoever is has the tools to succeed. We always ask agencies, if a client were to call in right now, how long would it take you to pull up their information and answer their questions? Especially if their agent is out of the office, would someone else be able to look at their contact record and understand what’s going on? If you’re managing your database out of paper files or Excel spreadsheets, quickly finding client information and servicing them can be difficult. This is just one of the reasons more insurance agencies are switching from spreadsheets or paper files to an industry-specific agency management system like AgencyBloc. I think you can probably see the theme of this entire blog here. In order to capture voluntary and forced switchers during this year’s OEP, you need the right tools on your side, including business and marketing automation. Medicare AEP begins in just 52 days from now, and Open Enrollment season begins in 69. What is your agency doing to prepare your agents and staff? If you’re thinking an AMS would probably be beneficial but are worried you won’t get up and running before OEP begins, that’s ok. However, it would be worth a call to see how quickly you can get going. For many of our clients, we tend to have them up and running within a few weeks, depending what their data migration is going to look like. Either way, it’s best to get the conversation started now. You’ll thank yourself! Ready to See AgencyBloc for Yourself? Schedule a live, 1-on-1 demo to see the agency management system for yourself and get your unique business questions answered.